The header of this post sounds like a title from some profound book. But it is not ! Its only about my tiny jade lotus strung up with the larks head knot in blue/grey cords. Jade lotus vintage about 50-100 years old. 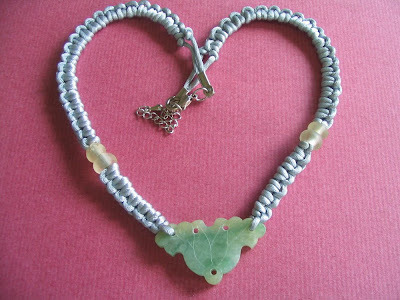 There are also 4 ancient Vietnamese white glass beads accents. Planning to wear this for the Lunar New Year.